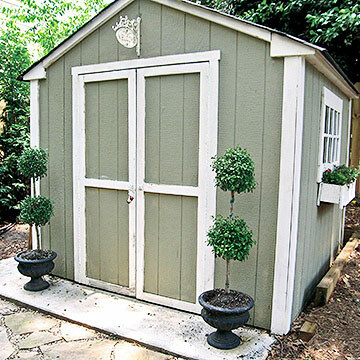 This store-bought shed lacked style and design and didn?t have any storage space for garden tools. Designer Annette Joseph took the typical shed above and turned it from a simple outdoor storage shed to a pretty, functional garden planting and prep room. The bright exterior looks great while the interior includes storage solutions for tools, garden hose, pots and more. 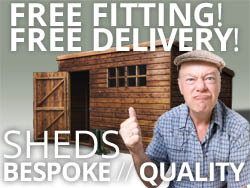 The sheds interior makeover focused on creating a garden work space, keeping garden tools off the floor and adding storage. 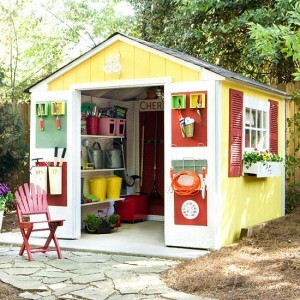 This shed uses colour as an organisational guide. The cheerful red paint from the exterior carries on inside. 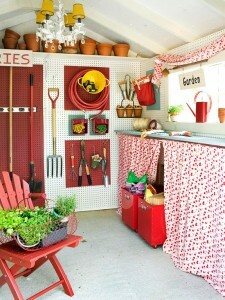 The red is paired with soft-grey blacks to help differentiate tools. Open shelving is a great place to stack pots. These fun cherry curtains are mounted under a shelf-turned-work-counter to hide rolling bins filled with soil. 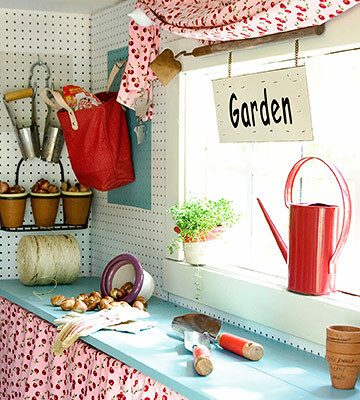 The deep windowsill doubles as a shelf for pots, plants and watering cans. 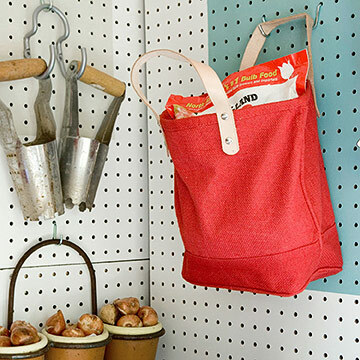 These pegboard sheets are nailed to the shed walls to keep the shed organised, tools used for a common purpose are given dedicated spaces. 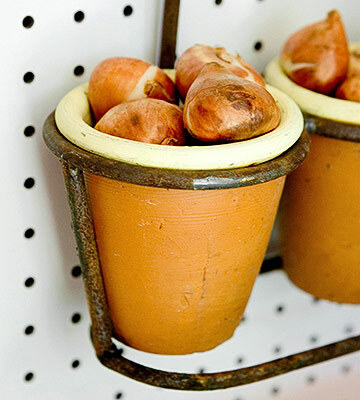 Plants, bulbs and bulb food hang within easy read of each other. 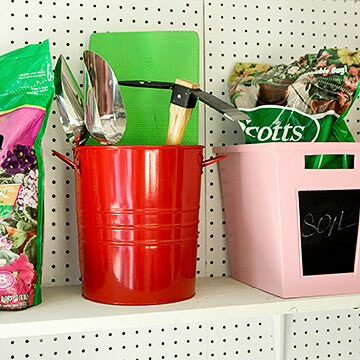 Turn metal bins and buckets on their sides to create deep, easy-to-see storage caddies. 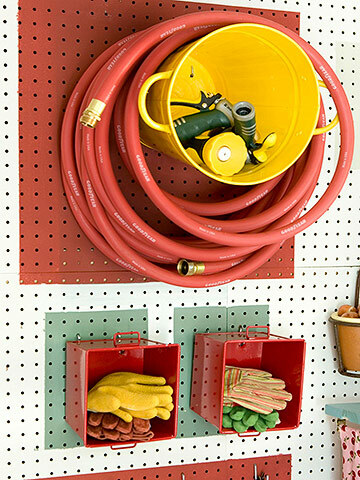 Brightly paint them to coordinate with the shed exterior and the yellow bucket acts as an on-the-wall garden hose holder. Take advantage of tools with wrist strips to sort and hang them on a pegboard. Drill a hole under the lip of an old tin cup and string a piece of twine through the opening to give it a new job as a hanging seed pack organiser. Multiple shelves hung from the pegboard triple the amount of space to store wellies, compost bins, watering cans, hand tools, soil amendments and more. 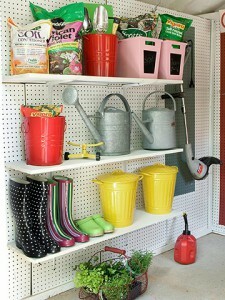 They also free up floor space to set down items such as herbs from the garden. 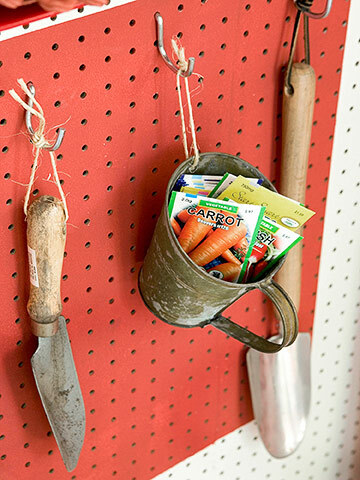 A red-painted bucket filled with hand tools becomes a portable carrier for quick planting. 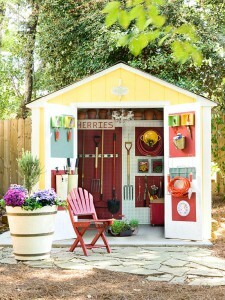 Its cherry red colour coordinates with the sheds colour scheme but is also easy to spot in the garden. The painted pink wooden storage includes chalkboard insets that allow for quick labelling and relabeling as the contents change. 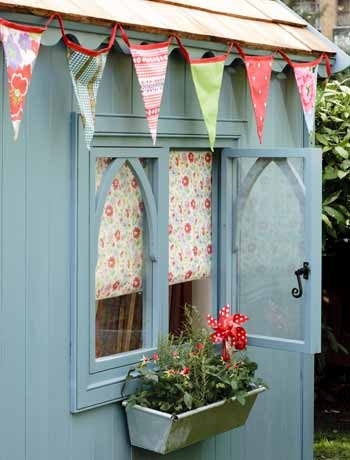 When looking for storage space, don?t overlook the backs of doors. 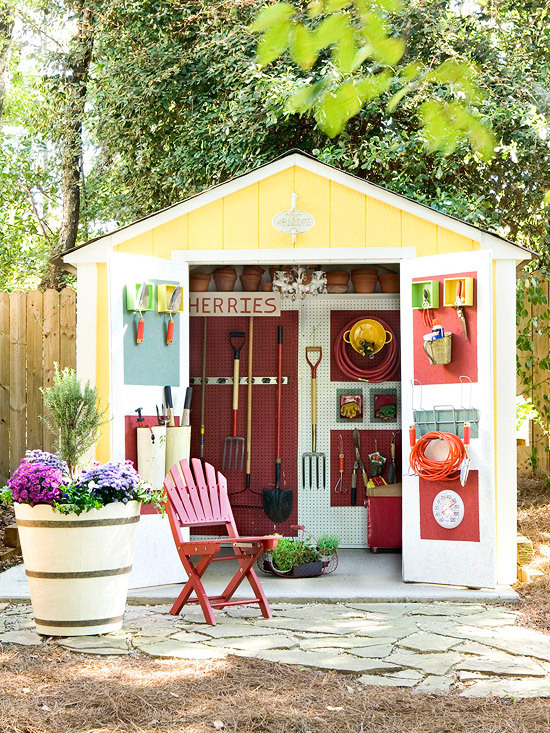 Repeat the same colour scheme and add buckets on hooks and nail in boxes to keep garden tools such as pruners and trowels handy. 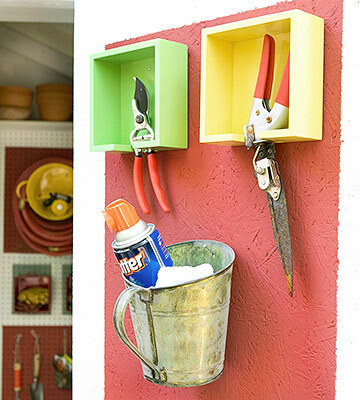 Wooden napkin holders get a new life as a storage solution when painted and hung vertically to cradle small hand tools such as trowels. Flea market finds including sap buckets, turn into fun, cheap, and tool organisers. Sap buckets are an especially smart solution for long handed tools. Repurposed napkin holders and a vintage tin pitcher add style and function to the sheds interior design. 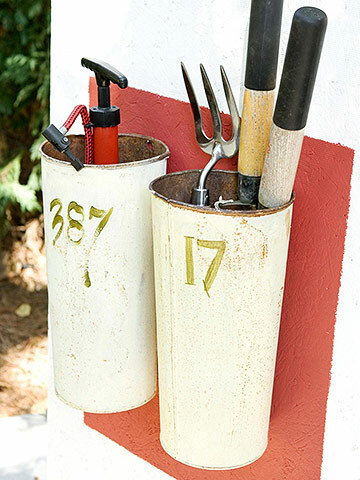 Use them to keep hand pruners and insect repellent within easy reach of the garden.